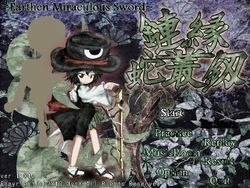 This page lists other documentation in regards to Earthen Miraculous Sword. where folks of unclear gender go do this and that. This is an updated, easier version of that, to be more precise! Can you imagine that, kinda like this, imagine this atmosphere...?" There are six main stages and an extra stage in the full version of the game. Apart from a secret playable character being implemented, there were also some significant changes to the game between the previous v1.01a and v1.10a. The biggest difference is that danmaku and spell card patterns throughout the game have been re-worked on, and some may be considered simpler compared to the original. In the main Japanese title, the complex-looking kanji "鏈" in "Len'en" has been converted to the simpler-looking "連" throughout most of the game. This is to update the standard kanji JynX is currently using with Brilliant Pagoda or Haze Castle. The graphics on the title screen and the gameboard have been re-worked on, one reason being the point mentioned above, along with a unique gameboard for the hidden playable. The alternate full-screen mode from Brilliant Pagoda or Haze Castle has been added to the configuration program. All text-related files are now open-source outside the dat.led file in accordance to Brilliant Pagoda or Haze Castle, making it easier for one to customise them. Some 3D background were re-worked on. E.g. the stage 1 bg having fog in the distance, and stage 2 having less trees. The player starts with three lives rather than two on lower difficulty modes. Dialogue boxes now have a grey bar over the speaker's name. A new selection screen has been implemented into the game, where the player can select Basic or Light mode. Basic mode has everything defaulted from before, whereas Light mode simplifies gameplay by giving the player maximum amount of lifes, doubled item drops, and starting the game with 2.50 power. The shot sheet has been updated to that from Brilliant Pagoda or Haze Castle. Music from the Music Room will now still play when the game is hidden. A lot of the data from the game's prequel, Evanescent Existence, is present in the game files, such as character portraits and sprites, as well as the graphics for their titles. This is due to both games being developed and released simultaneously. There is a sprite of a yellow circle with an "S" in the centre (also present in Evanescent Existence). This would later be used in Reactivate Majestical Imperial as a full powerup item. There are two unused enemies in the game: a black T-shaped enemy with a green eye in its center, and a grey-and-black enemy that resembles a snake with wings. JynX stated that both of these enemies were intended to be Tsurubami Senri's shikigami, but were cut from the game due to this not being obvious. Both sprite sheets are also present in Earthen Miraculous Sword and Reactivate Majestical Imperial. The game is known to crash before the fight with Tasouken. Running the game through OllyDbg will remedy this issue. When playing as Suzumi Kuzu, Hibaru Kokutenshi's and Adagumo no Saragimaru's on-screen boss title won't appear. Saragimaru's spell card Sacred Treasure "The Sword that Doesn't Sever Relations" may not loop, meaning they'll play one pattern for the duration of the spell. This page was last edited on 29 September 2018, at 20:34.